Gone to Fight the Indians —Part II – Fix Bayonets! 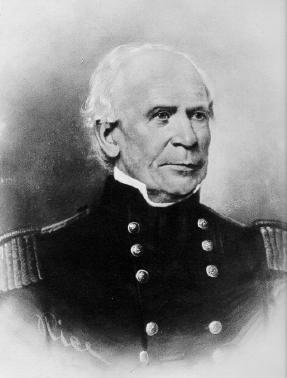 At the outbreak of the Second Seminole War, the Commanding General of the U. S. Army was Major General Alexander Macomb. There were only four other flag officers serving at the time: Brigadier Generals Edmund P. Gaines, Winfield Scott, Thomas Jesup, and Zachary Taylor. The first American commander of the Seminole War was Winfield Scott. Scott initiated a conventional military strategy against the Seminoles; Napoleonic style maneuvers typical of Army doctrine at the time. With three converging columns, Scott marched on the main Seminole camp near present-day Lake Apopka. The Seminoles responded by scattering into the Florida swamps and resolved themselves never again to mass in one place. 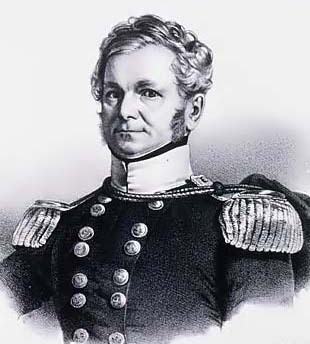 Scott’s ineffectiveness early in the war was likely the result of public quarreling with General Gaines over Macomb’s appointment; Scott simply could not focus. Neither could Scott negotiate with the Seminoles. Not bargaining from a position of strength, the Seminoles saw no basis to relinquish their hit and run resistance strategy. Brigadier General Jesup, however, proved to be a more effective field commander. Having successfully suppressed a Creek uprising in western Georgia, Jesup realized that the only way the Americans could defeat the Indians was to employ unconventional tactics. He mustered a force of 9,000 men (half of whom were regular army) and a battalion of Marines consisting of 38 officers, 400 enlisted men. Jesup organized the Army of the South into two brigades. On January 8, 1837, Jesup gave Colonel Henderson command of the Second Brigade. To Lieutenant Colonel Samuel Miller he gave responsibility to guard convoys moving between Tampa Bay and the Army depot at Fort King (near present-day Ocala, Florida). General Jesup directed his commanders to begin a series of search and destroy operations that soon produced a positive result. Over time, Jesup was able to wear the Indians down with small attacks that threatened their families and their sources of supply. It was an effective counter to Osceola’s hit and run strategy. On January 23, 1837 near Lake Apopka, a detachment of Captain John Harris’ company of horse Marines engaged a large body of Seminoles; the Indians quickly disengaged into the thick underbrush. Five days later, Colonel Henderson led a force into the Swamp to locate and engage the main body of Indians. When allied Indians made contact with the Seminoles, Henderson set in a line of Marine and Army marksmen along the Hatchee-Lustee River. Allied Indians and Seminole engaged in a lively exchange of fire, and when the fire slackened among the Seminoles, Henderson knew the enemy had begun their withdrawal. Captain Harris aggressively attacked across the 20-yard wide river. Mounted Marines captured some women and children; also taken were one hundred packhorses, and 1,400 head of cattle. The warriors escaped, taking their dead and wounded with them. Having lost their families and food supply, Seminole warriors sued for a parley in March 1838. Several chiefs consented to a truce and relocation to the Arkansas Territory; they signed an armistice on March 6, 1838 agreeing to assemble at Fort Brooke for removal. Every indication was that the war was over, except that Osceola and Arpiucki (a.k.a. Sam Jones) did not come in. Henderson received promotion to Brevet Brigadier General, the first Marine Corps officer to hold general officer rank; Captain Harris received advancement to Brevet Major. Henderson returned to Washington in May leaving the command of 189 Marines at Tampa Bay to Brevet Lieutenant colonel Miller. According to the agreement, Seminoles began to assemble at Tampa Bay; everyone was convinced the war was over. It was not. Late at night on June 2, 1838, Osceola led warriors into a poorly guarded encampment outside Fort Brooke, captured the compliant chiefs and their followers (numbering around 700 Seminole), and forced them to un-surrender. The war began anew —and continued for another five years. Osceola’s refusal to surrender led General Jesup to employ unconventional negotiations. In October 1838, Osceola and Coeehajo agreed to parley with General Jesup under a flag of truce. During the meeting, Jesup seized both men and took them into captivity. Osceola died of Malaria at Fort Moultrie, South Carolina three months later; he was just 33-years-old. Some sectors criticized Jesup for his un-gentlemanly tactics, but it did result in removing Billy Powell from his position as a revered Seminole leader. Meanwhile, the Americans continued to use unconventional tactics against the hostiles. Brigadier General Walter Armistead destroyed 500 acres of Seminole crops. In another instance, Colonel Harvey had his men dress as Seminole warriors as a means of entrapping hostiles. Harvey also received $55,000 from the US Congress to bribe Seminole chiefs to bring in their bands. Braves were paid $500.00 to surrender; their wives $100.00. In the summer of 1838, the Navy put together a special landing force consisting of small ships and dugout canoes. They called it a Mosquito Fleet. It gradually increased it strength to 652 men, which included 130 Marines. The fleet based at Tea Table Key; its mission to interdict gun smugglers from Cuba in their attempt to funnel arms and ammunition to the hostile Seminoles. Schooners patrolled off shore, barges ranged close in to shore, and canoes patrolled estuaries. In 1841, the Seminole War was costing the US government $1.1 million annually. By this time, Brigadier General William Jenkins Worth led the war effort in South Florida. He viewed the cost of continuing the war irresponsible and convinced the Congress to leave remaining Seminoles in peace if they stayed in the southwest part of south Florida. Those left in Florida included bands led by Holata Mico (Billy Bowlegs), Arpicochi, Chipco, and the black Seminole leader Kunta Kinte . The black Seminoles were especially determined to keep fighting; their point of view being that dying was better than enslavement. Well, the United States of America had had enough of the Seminole War but now that the American Army had caught the tiger, the tiger was not letting go. The Seminole Wars continued for another 40 years and the last Native Americans living in the Everglades never surrendered. Between 1835 and 1842, the US lost 1,466 men to combat or disease. Sixty-one Marines died in the conflict. Forty years? Incredible. My dad was born just 20 years later. Swamp fighting must have been hideous. Talk about the ills the Marines (and everyone else for that matter) endured in the Pacific 40 years later. I would think jungle rot, trench foot, etc., would have accounted for some of the casualties?